This particular project started with a homeowner who wanted to do something a little bit different in their beautiful historic home in Tempe Arizona. The homeowners looked at several prefinished hardwood flooring options on the market however they weren't able to find what they envisioned. They stopped by our Gilbert location and expressed their frustration. We sat down with the client and talked about doing an unfinished engineered hardwood project so that we could sand, finish and colorize it to their specifications on site. The homeowners jumped at the idea because that's how they have gone about doing their cabinets and pretty much everything else they've remodeled in their home. The homeowners looked at samples with varying widths and species available in unfinished engineered hardwood, and they decided to go with a 4-inch select White Oak. White Oak is very durable and easy colorize and will fit the look of this project very well. The client also decided that they wanted to add a little bit of texture to the flooring and didn't like the idea of just doing a hand scraped look. We suggested a wire brushed texture and after showing them a few examples, they decided that the wire brushed surface was the way to go. Wire brushing is a technique that takes the softer grain out of the wood and allows for a more durable surface on top of the plank adding to the White Oaks durability. We found a small family owned mill to produce the product to the 4” white oak specifications and we then ran it through our wire brush machine in our warehouse. After we texturized the planks using our Wire brushing process, we then glued the planks down direct to concrete using Fortane LD adhesive. Fortane LD Adhesive is a urethane adhesive that is ideal for glue-down installations on all grades and types of wood flooring. After the adhesive cured, we lightly buffed and smoothed the floor and prepared it for the colorizing process. Did you know that you can colorize engineered hardwood flooring? This it true to a point as it depends on how thick the top layer of hardwood it has and how it’s installed. For example, floating floors can’t be sanded so colorizing wouldn’t be an option. The homeowners chose a natural look, in fact it was so natural that it almost looked like the wood was raw and had no finish on it whatsoever. After playing with a couple of different types of sealers, we found the formula they wanted. As a final finishing touch the homeowners decided that they wanted something different done to their baseboards, so we milled the baseboard profile out of the existing material that had the wire brushing texture on it. It was a basic profile but very much fit the style and décor of their home. In the end, the homeowners were thrilled with the outcome of their new flooring. After the project was complete we received calls from a couple of their neighbors who are eager for us to install a similar style floor for them as well. 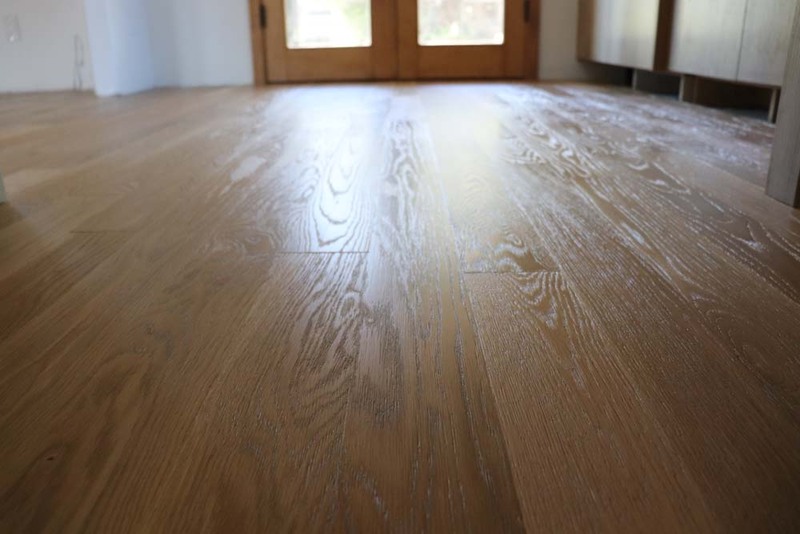 Arizona Hardwood Floor Supply is a full-service wood flooring company, offering a complete range of residential and commercial services including engineered hardwood flooring installation, cleaning, sanding and refinishing. Our established presence and long-term relationships in the industry allow us to pass our buying power and low overhead on to our customers in the form of savings. Just bring your imagination to us and we’ll make it come true. We use only in-house installers instead of subcontracted laborers, which allows us to maintain our strict quality control standards and ensure that every job is done right. Our sanders and finishers are wood floor specialists who know how to make a dull, worn floor look like it just came out of the box. Contact Arizona Hardwood Floor Supply today to get started on making your flooring the star of your home at (623)742-9663. Of course we always welcome you to stop by one of our 3 Valley locations for more information on custom flooring installation and refinishing services.